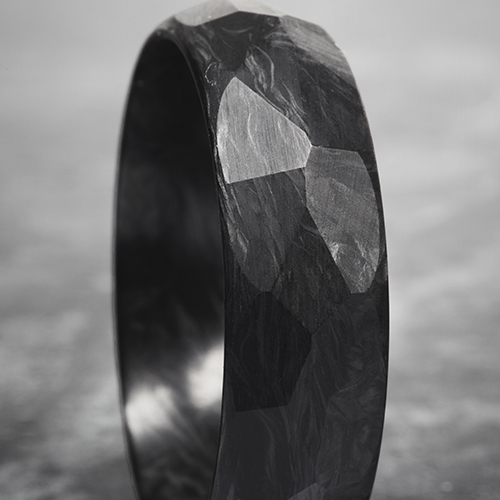 Carbon 6 introduces new faceted carbon fiber wedding bands for retailers this June, accented with 18K gold. What makes forged carbon so striking, compared to other carbon fiber rings, is that the depth of layers that are reminiscent of marble. The faceted design now adds even more dimension, emphasizing the visual depth of the material. Inspired by the look of honed marble, Carbon 6’s new Faceted Forged Carbon collection offers the company’s signature forged carbon fiber, in a new faceted design. The modern look is a perfect complement to the cutting-edge material’s performance and aesthetic. Carbon 6 makes their forged carbon fiber at their Brooklyn workshop, where each ring is handcrafted entirely in-house. 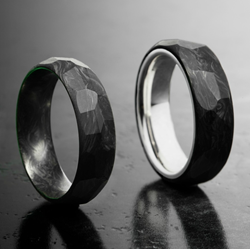 The faceted design is available both as a solid forged carbon ring, and with an 18 Karat white gold interior. The new styles are timed to coincide with retailer buying at the June Vegas shows, and the company’s quick turnaround of 1-2 weeks ensures the rings and full display will be ready and shipped in time for wedding season customers. For retailers looking to add a men’s ring line with a sophisticated and modern style, Carbon 6 is the premier choice. Displays feature a striking combination of walnut and brass, and are customizable. For new customers, the company is offering complementary shipping and a display with the buy-in for the collection. For retailers interested in meeting with Carbon 6’s founders at JCK, please contact Olga Gonzalez, Pietra PR, at 212-913-9761 or at info(at)pietrapr(dot)com to set up an appointment, or visit them at booth B19134.